In the rural peace within Cholmondely Castle estate in Cheshire a group of white and blue buildings contains workshops in which 25 or so craftspeople are bent on achieving perfection to the last detail and high-gloss finish. The makers, each responsible for individual pieces that they see through from start to finish and fit-out, work singlemindedly on their own projects. In the sawdust-free workshops men and women, mainly using hand tools, concentrate on producing furniture for super yachts. Silverlining was started in 1985 by Mark Boddington. As a boy he was fascinated more by the work in the cabinet shop where coopers and joiners made everything from beer barrels to bar tops than by the process of brewing that is the family business. He trained with John Makepeace at Parnham House, at his graduation show exhibiting a table inlaid with silver. The long, thin pieces of inlay were added to strengthen the vulnerable edges of a table where two 0.6mm-thick veneers came together. Thus was the name Silverlining chosen, with the use of silver hallmarks to register each piece of furniture in the company name. Moreover, that piece of inlay ingenuity could be said to be the cornerstone of Silverlining, for in a sector of the industry that can be a little set in its ways, and with Art Deco still tending to rule the Mediterranean waves, the business runs a design and project management team which is committed to breaking the boundaries and finding solutions to every obstacle that the pursuit of innovative design might put in their way. Mark adopted the belief of John that nothing is impossible and at that graduation show took orders worth 34,000 pounds, around 70,000 pounds today. On the strength of that he set up business with Adrian Foote, Head Craftsman for John, and they established a workshop on the Grosvenor estate near Chester. Soon after taking on an apprentice Mark needed a pin inserted in his leg following a car crash. He said that he decided if a thin piece of metal was strong enough for his leg, it was strong enough for making furniture. 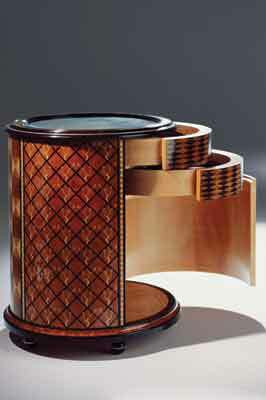 From that point onwards they started making very elegant tables that were essentially a metal core clad in wood. This anecdote illustrates the innovative approach adopted by Silverlining. Head of Operations Chris Schaefer explained that in order to break into the lucrative super yacht market they attended the elite Monaco Yacht Show five times before hitting success. That perseverance has resulted in full order books since then and when Derek Jones and I visited work was progressing on five separate commissions, one in traditional Art Deco style, one in Art Nouveau, two Modern Contemporary and one that breathes 21st-century flowing lines. One of the yachts is a massive 91m long and features a huge dining table with a carbon fibre base and metalised finish, inspired by the car industry, and a burr walnut-veneered top, its pattern referencing leaves. 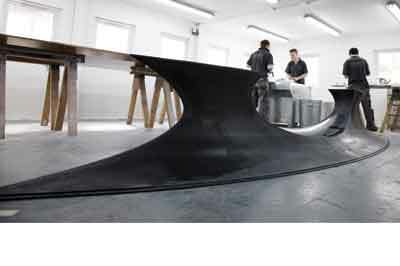 The table will be full of electronics, to be piped through the carbon fibre. 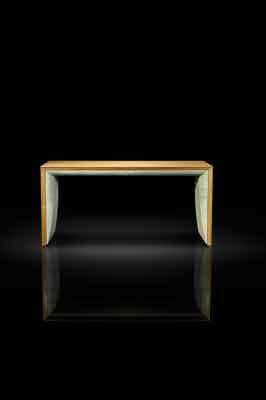 Elsewhere Polish maker Rafal Wisniewski was making a coffee table to be covered with leather on top of fibre glass. Its organically shaped base will flow into the leather floor of the saloon. Neoprene is used to form a comfortable sandwich between the fibre glass and leather. In the carving workshop Ron Hester was making a full-scale mockup using sika block of half an Art Nouveau carved desk. He said that this was the prototype phase which could be tweaked so that when the real thing was made in walnut there would be no mistakes. The desk had virtually no straight lines on it so they needed to work together to work out where the joints would go. Silverlining has a multicultural team, recruiting the best people from all over the world and Project Manager Hannu Hietamaeki, a Finn, explained that they were all trying to push the boundaries and do innovative progressive furniture. There was much expertise in house so it was a balance of collaborating with people they wanted to learn from. For example on one of the projects they were working closely with engineers who were involved in Formula One to produce a complex furniture piece. Polina Parshina, who is in charge of marketing, said they felt there was a terrific gap between design and craft. They thought the highest level of craftsmanship should go hand in hand with the highest level of design. A lot of the time they had been making to client designs. The yachts had all been Art Deco, but why? They were now deciding to do unconventional things and step out of the sub contractor role, thinking about design. Hannu said that Art Deco was one of the last high grade of crafts periods. Because of that they had quite a lot of ideas for the philosophical side of doing high craft objects. To showcase their thoughts and collaborative work with boat designers Silverlining published a book last year exploring the future of yacht interiors and furniture which went down well at the Monaco show. It describes how Silverlining could work with yacht designers and looks at new technologies and how people live today. Polina said there projects were designed for longevity. They were trying to design an environment that could not be changed with a refit on change of ownership. They had a reputation for being very expensive but also for producing the best quality. While the main show material is usually timber, often in exotic veneers, much carbon fibre and fibre glass is used. Typically, to save weight on board a yacht, the pieces have a substrate of paper or aluminium honeycomb. Ha nnu said that their main goal was to have a different integrity for a marine rather than house environment. To that end there was a controlled moisture content in all workshops. A piece that had to go around the world could not use solid timber. 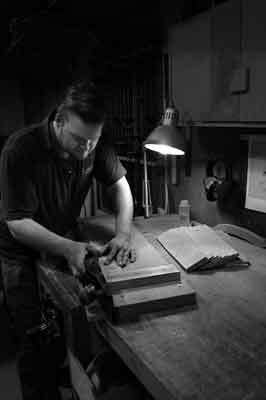 The workshop manager is Gary Tuddenham who trained and worked at the Edward Barnsley Workshop for five years and won the gold medal for cabinetmaking at the 2007 WorldSkills competition. He said that at the Barnsley Workshop they used predominantly hand tools. If the quality was not right you had to remake the piece. Here, however, they were working within fixed time constraints so had to do the perfect job first time round. At the sea trials the boats were tested at 45 degrees either way. Why clients wanted Silverling was because they maintained elegance within a marine environment. Of course the making process starts with design, developed from drawings onto AutoCad mostly and here there has to be an eye for fine detail, with every drawer for instance needing a locking mechanism against rough waters. Life aboard dictates curves. Sharp corners are simply dangerous. To find a way of coaxing veneers around corners a 3D model of the curve is made and then flattened out into 2D to determine how the veneers will be laid on. In this way the work is de-snagged at the design rather than the making stage. Each piece is made by a single maker in order to maintain quality. Silverlining recruits only the best and New Skills Development Coordinator Adam Findlay regularly visits top colleges. After lunch everyone rises from the table as one and returns eagerly to work, and as we prepare to depart our eyes are drawn to a prototype of an upholstered chair in which bolts are substituted for mortice and tenons to test the aesthetics and ergonomics of a future luxury piece. Yes, this company is pushing the boundaries with the help of a very willing and committed crew. To produce work of the highest quality it is important to have a clear vision of the finished article at the beginning of a project and remain focused on it right up to completion point. Visible screw heads are individually treated to a satin finish through four grades of abrasive paper, each component being stroked in a single direction to achieve a uniform finish. This process is repeated for any associated hardware and for decorative features. 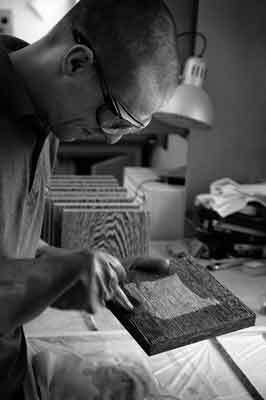 To minimise the effects of telegraphing, carcass work generally receives a backing veneer laid with a care and eye for detail usually reserved for the face veneer. This process makes for a sound base on which to apply the chosen finish. In finishing shops that are specifically designed for each stage of the finishing process the obsession with perfection is as evident as ever. 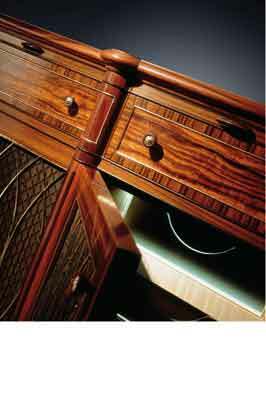 Polyester lacquers are the preferred choice of finish for the marine environment whether satin or high gloss. It is a popular misconception that spray finishes require little skill to apply. Results can indeed be achieved quickly, but quickly is not the Silverlining way. The base coat of lacquer on a 6m-long dining table will take about two days to flatten before a second coat is applied. This in turn will be worked using wet abrasives, a process that typically takes a week. A flawless gloss finish is obtained through the use of compounds over a similar period of time.